Three medical device companies, Zimmer, DePuy and Stryker, manufacture the majority of knee replacement and reconstruction devices in the United States. According to a recent Global News Wire report, these three companies, along with Smith & Nephew, are the “main players” driving the growth in the market for knee replacement products. Unfortunately, medical devices being implanted in patients with knee troubles may not be very safe and may have certain serious complications. More than 600 federal lawsuits have been filled against Zimmer because of complications with the company’s NexGen knee implants and problems have also been reported with both the Scorpio implants from Stryker and the OXINIUM devices from Smith & Nephew. If you or a loved one was affected by problems with a knee replacement product, you should consider taking legal action to hold the company accountable for complications caused by its defective medical device. A Boston defective knee implant lawyer can help you to obtain compensation for losses and damages. The U.S. knee reconstruction device market is expected to grow to more than $5 billion by 2020 as more people seek joint replacements than in the past. 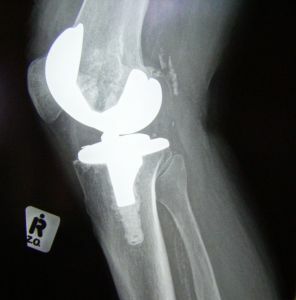 One reason for the growth in the market is that the demographic of knee arthroplasty patients is changing. Younger patients are now turning to knee replacements in order to maintain their mobility for longer periods of time. The obesity epidemic is also resulting in more people experiencing stress on their knees and joints, which means a greater need for joint replacement or reconstruction surgery. Advances in technology are also helping to drive the market. Custom implants are sold to patients as a way to get more flexibility and new joints that last longer, even if it doesn’t turn out to work that way. Knee cutting blocks are also helping to make procedures easier, as they can enhance the fit of knee replacement joints and thus increase functionality and decrease the time it takes to heal. Unfortunately, not all advances in technology have been good ones. Older devices generally use a cement-like adhesive in order to hold the components of the replacement joint in place. Because the cement can break off the bone, newer models like NexGen promised to provide a better solution by allowing the bone to fuse to the implant. The problem is that many patients have ended up experiencing loosening of the joint, and the NexGen products have a high failure rate. Artificial joints are supposed to last about 15 years or longer, but researchers from Austria concluded that as many as 30 percent of the new knee replacement products are less durable. DePuy’s Sigma knee implants had such a higher revision rate due to failure that the devices have actually been recalled. If you or a loved one had a knee replacement procedure and experienced complications, you may have a right to obtain monetary compensation for the cost of the revision procedure, the pain you endured, work you missed and other losses and damages.